You know that feeling when your stomach fills with concrete and the whole world slips a little left? That was my experience in September 2013 when I was unexpectedly laid off. Six months later, I would feel it fiftyfold—from the rooftop edge of a 40-story building. A habitual reader and career editor, I’m much more at home with my nose in books and my fingers on a keyboard. Looking up and stepping out of my wonderful, cozy comfort zone is something I don’t do often, and never on this grand a scale. Thankfully, I had the support of some fantastic people—and one crazy photographer—to give me a push. To say the journey from suburban Alexandria, Virginia, to a skyscraper in San Francisco was unexpected would be underselling the serendipitous whirlwind that brought me to SmugMug and the world of Benjamin Von Wong. And the new family I gained. As a classic introvert, I’m most comfortable surrounded by walls of my own making. After I was laid off, I had to knock down one of those walls to network. This might seem a mild thing to most people, but to a quiet, introspective, independent person, it was a nausea-inducing prospect. I had to actively reach out and call attention to myself? Willingly? And ask for help, too? Dramamine and I became close friends during this time. A good friend from SmugMug reached out to ask if I’d be interested in doing some contract writing work. I gained a few bruises from jumping so hard at the opportunity. I’ve been a SmugMug customer since 2006. Through their photography forum, shootouts, and workshops, I became friends with many in the company, though none quite so close and loved as the person who usually wrote the infamous SmugMug blog posts: Schmoo Theune. For years I’d quietly nursed the dream of working with those friends who equally loved photography. Around this time, SmugMug began gearing up to launch its new inspirational video series, SmugMug Films. 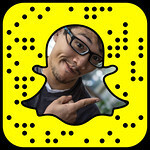 The inaugural subject would be photographer Benjamin Von Wong. And three days before launch, SmugMug asked if I wanted to interview him and write up an article. During the winter holidays, I received a message from him through LinkedIn. Peppered around the compliments on the article were tangential questions about my current work status. Several weeks and interviews later, I was offered my dream job. I moved from Virginia to California two weeks after I accepted the offer. Six weeks after I landed in sunny CA, Benjamin Von Wong visited the SmugMug office. I sought him out with a smile. The answer immediately swept me into the wonderful hurricane that is Von Wong. Baldy loves BIG prints. Von Wong loves EPICness. Get the two together in the same room, and the idea of photographing people suspended on the ledge of a high-rise building isn’t as crazy an outcome as it might seem anywhere else. Von Wong pursues the type of creative photography I aspire to, so I knew I wanted to be involved somehow. When an email went around asking for those who wanted to be heroes for the shoot, I submitted my name for the drawing—with the caveat that I’d love to just be a grip or voice-activated lightstand or anything else that kept me comfortably behind the scenes where we introverts like to participate. My name was drawn from the hat. To be a hero. Okay, I reasoned to myself. First off, we haven’t secured a roof, so the likelihood of us pulling off this shoot are slim. Second, if we do somehow find a roof, no way will they find a harness large enough to fit me. What I hadn’t yet learned is Von Wong has a way of making the impossible possible. The selected heroes were taken to the roof of our two-story SmugMug office to test harnesses and ensure none of us were afraid of heights. Funny how standing on a ledge looking two stories down didn’t phase any of us. We laughed at how easy this would be. And we would later regale each other with how silly we were for thinking that. Then came the harness fitting. Mine didn’t fit. Relief instantly cooled the sweat on my brow. “Wait, I didn’t fully adjust it,” Von Wong said. He adjusted. It fit. My heart fell past my feet and landed two stories below somewhere. My failsafe excuses had failed. 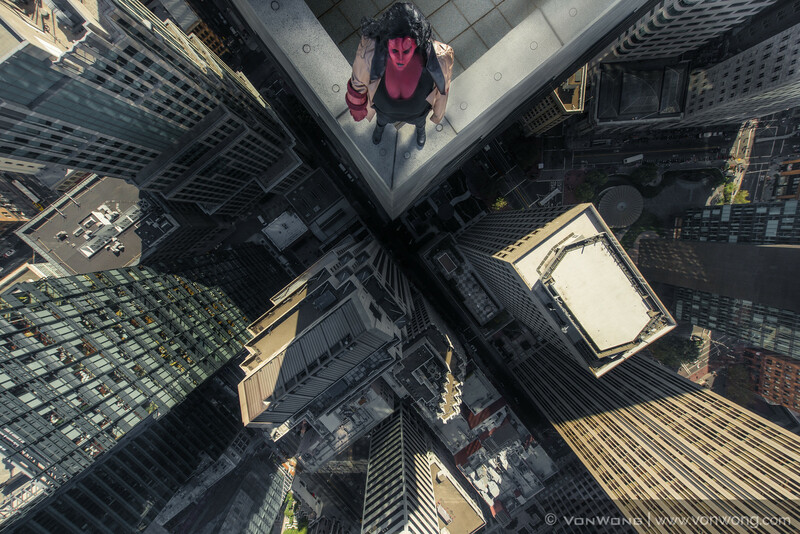 Soon, I would be one of six superheroes standing on a ledge 40 stories above Market Street. We had four days to coordinate characters, costumes, gear, and travel logistics. Which was a thankfully hectic distraction from thinking about plummeting to death shortly after obtaining my dream job. While we all worked at SmugMug, each hero had been randomly selected from a different department: design, facilities, support, marketing, CEO. We fell into an instant camaraderie that only fear-tinged excitement can produce. Conversations happened easily. We helped each other with costume challenges. I barely knew my new coworkers, and we were about to participate in the ultimate trust-fall exercise. But that lack of long-time knowledge didn’t matter. Our lives would literally be in each other’s hands, and we each trusted that we’d be safe. That didn’t prevent my voice from shaking as I inched nearer to the ledge when it was my turn to be photographed. I have swum with sharks. Leaned against the fence atop the Empire State Building. Climbed uneven, eroded steps of many a Mayan temple. None of it prepared me for the heart-stuttering fear that seized my chest and throat as I slowly stood on the edge of a skyscraper. I blindly held one arm back so someone could slip on my Right Hand of Doom. “Look up!” Von Wong shouted from somewhere behind me. As if looking down were even an option. “I can’t feel the harness!” I screamed. Or think I screamed. Between the cold wind and fear, it was probably a squawk. But whoever was holding the harness heard me and gave it a tug to reassure me they were there. Fists clenched, I looked up at the camera dangling several feet out over the building’s edge, swaying with the wind that whipped the trenchcoat I’d thought would be such a great idea for this shoot. “Okay, now look ahead!” Von Wong called. I stared at building tops, blue sky, and clouds. Sirens and the faraway hiss of traffic floated up from far below my feet. The only other thing I could hear was Von Wong shouting behind me. He may have shot five frames before the panic rose so much I truly had to step off the ledge. It was a big step backward and down. I lost my balance and landed poorly. It left a really nasty bruise on my knee. Never again, I thought to myself. That was crazy. How the heck did you get involved in this? Never, never again. “You’re going to get back up there,” Von Wong teased as he showed me the shots. I work with the best heroes in the business. And not once have I regretted it. This is part 2 of my Ordinary People Transformed series, which I did as part of SmugMug’s Artist in Residence program. Huge shoutout to SmugMug who not only host my beautiful website but encourage, support and inspire the entire photography industry with their creative projects. I’ll be joining the Fstoplounge for a workshop in Fiji in October! Learn more here. I just built a brand new gear guide. Check it out and let me know what you think! Ever wanted some Von Wong shirts and hoodies? I’ve finally made a brand new store here... and it’s currently on discount! I’m hunting for great causes to raise awareness for, anywhere in the world. If you hear of anything, please let me know!  Archived in Guest Posts and tagged BTS, diary, hellgirl, superhero. Bookmark the permalink.